If your company is implementing VoIP or expanding the use of VoIP applications, you're probably uncertain whether your existing data network is ready to carry high-quality voice conversations. Our tools monitors the routers, switches, and WAN links on your network to determine their present utilization rates. It assigns them a VoIP Readiness Rating indicating whether upgrades are needed before the additional VoIP packets are added to the mix. In addition, it sends simulated VoIP traffic between pre-selected points on a network for a period of time you select. While the simulated calls are running we take measurements and calculate call quality scores. We run reports to quantify the data collected over the course of the assessment to help determine your network's readiness and capacity for handling real VoIP traffic. What's Involved in a VoIP Readiness Assessment? two floors or two departments etc). Configuration Assessment: Compare information about device configuration gathered during the Network Inventory to a set of rules you supply, based on vendor recommendations, and report any disparities. Utilization Monitoring: Monitor discovered network devices and links to determine their current CPU, memory, and bandwidth utilization, plus other significant metrics. Bandwidth Modeling: Compare VoIP usage scenarios to estimate the call capacity of the network links you've been monitoring. VoIP Quality Assessment: Determine how well VoIP will perform on your network by measuring simulated VoIP traffic and calculating Call Quality based on a Mean Opinion Score (MOS). 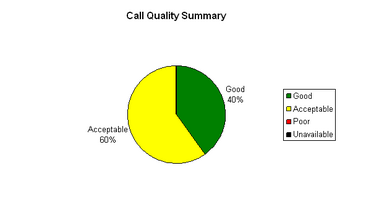 The chart below is an example that shows the percentage of all calls completed during an assessment that fell into each category of call quality. "Unavailable" call quality indicates that a call could not be connected or failed. 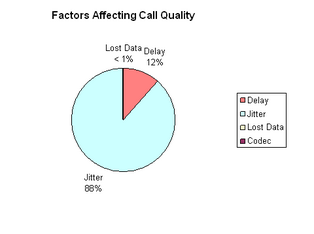 The chart below is an example that shows each call quality impairment factor's contribution to the overall call quality. Each factor's contribution is shown as a percentage of all call-quality impairments. � 2015 - Telecom Service of Atlanta, Inc.